Are there Affordable Policies for Cigar Smokers? Do you smoke cigars often? Haven’t you bought a life insurance plan yet? Are you paying higher rates of a regular cigarette smoker? Do you feel you policy's parameters are too narrow regarding smoking? There are many policy providers who recognize that not all smokers are created equally, and those companies can save you a lot of money with life insurance for cigar smokers. Often companies simply lump smoking of any kind, regardless of product or frequency, into the same non-standard category. As a result, rates for smokers -no matter how you smoke- are almost double what they would otherwise be. It is widely accepted that cigar smokers use their product very differently as compared to cigarette smoking and therefore are typically less susceptible to some of the harmful effects of tobacco. There is less overall tobacco consumed on a daily basis, and cigar smokers tend not to inhale smoke as deeply if at all. Unfortunately every smoker is faced with a dilemma when filling out their policy application as to whether or not to report the habit. To some degree this is understandable if the smoking occurs once every month or couple of weeks. The risks of occasional smoking can reduce or limit the chances of buying life insurance in the end. Nowadays policy providers are far more sophisticated in detecting such nicotine amounts using modern methods. Most of the plans sold in the U.S. require a paramedical exam which will test both urine and blood for various chemicals including cotinine, the active chemical in nicotine. The amount of money you pay for an insurance policy will depend, in part, on the results of this test. If you suggest on your application that you don't smoke tobacco of any kind, and nicotine is found, it will make the life insurance company suspicious about the answers you provided for other questions. Additionally, if it was found that you were not truthful about the answers you provided on your questionnaire, it might create a problem or two for you. For this reason, it is an extremely bad idea not to divulge tobacco use of any kind including cigars. Instead, find a company that has many different rating categories for smokers and treats cigar smoking a little more favorably. You can expect to pay a little more for life insurance because you smoke the odd Cubano, but in most cases it certainly shouldn't be as much as a person who smokes a pack a day. Get a quote today and find out how much you could be saving with life insurance for cigar smokers. Alternatively, dial our toll-free number and ask to speak to Blake. He's our very own cigar aficionado who will advise you of a certain provider that we represent who will guarantee you non-smoker rates as a cigar smoker, no matter how often you re-stock your humidor! There are cancer-causing chemicals evident in cigar smoke, just as with cigarette smoke. These will affect people both through direct use and passive smoking. There is no such thing as safe levels of tobacco use or safe exposure to tobacco products. The amount of tobacco you use is directly related to the likelihood of contracting a tobacco related disease. Smoking cigars makes you more susceptible to cancers of the oral cavity, as well as the lungs, esophagus and voice box (larynx). Whether or not you inhale, exposure to tobacco products can have a deadly effect. Insurance companies assess your application with this basic principle in mind. Although it is impossible to ignore these facts when you have to buy or renew a policy, the truth is that most citizens above 25 years of age have tried smoking and many continue to smoke into middle age and beyond. They need life insurance like any other person walking on the road. Policy providers treat every case in a unique manner. They know that one rule simply cannot be applied to all the situations. It’s simply a matter of risk assessment. 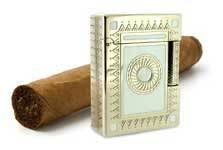 This is where life insurance for cigar smokers comes into play. You can get insurance at more affordable prices as a cigar smoker with certain providers who appreciate the difference in risk to that of cigarette smoking and other tobacco use. Speak to one of our licensed professionals today to see just how much you can save on your next term life policy.